If you have only just managed to switch your TV to digital, bad news - you may soon have to buy yet another box. A parliamentary inquiry today forecast a second wave of switchover as TV moves online. The House of Lords says the government should begin planning for every channel to be available online to free up spectrum for services like high speed mobile phone services’. Eventually the case for transferring the carriage of broadcast content, including public service broadcasting, from spectrum to the internet altogether will become overwhelming,' the Lords communications committee said in its report on internet infrastructure. 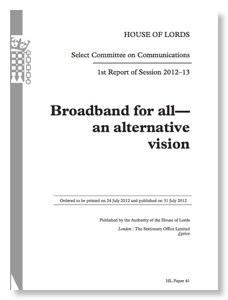 FCC sources report that the first draft of the National Broadband Plan had a discussion of reallocation from broadcast to broadband that was bolder than the final report but not as bold as this UK proposal. Within 30 minutes after the draft was given to the FCC Media Bureau, the Chairman’s Office started receiving calls from “The Hill” telling them to back off - such is the power of broadcasters in Washington! We recommend that the Government, Ofcom and the industry begin to consider the desirability of the transfer of terrestrial broadcast content from spectrum to the internet and the consequent switching off of broadcast transmission over spectrum, and in particular what the consequences of this might be and how we ought to begin to prepare. The UK report clearly recognizes that the switch would not be easy and that it should not be done until alternatives for media distribution are in place, operational, and affordable for all. But it recognizes the huge economic benefits of increasing broadband penetration - not just the benefit for certain industries, but for the whole society and economy. The US National Broadband Plan has a key issue that is clearly missing, no doubt as a result of the political intervention on the first draft: If the US can achieve near universal penetration of broadband to US households by policies including making broadband the universal service equivalent of dial tone, why do we need over-the-air TV in populated areas. Indeed, if we are willing to use DBS for universal service-like video distribution, why do we even need over-the-air TV in rural areas? Such a dramatic change has to be carefully planned and must respect the equities of the broadcasting industry. But is NBC in the business of pumping electromagnetic energy into the spectrum, most of which passes houses without any TV antenna, or is it in the business of putting together compelling programming that people want to watch and bundling that with compatible ads? Any such evolution must consider the needs of the economically disadvantaged and their right to continued access to “basic TV” as well as rural needs, but that is why FCC has had universal service programs. What does Justice Alito and the House of Lords’ Communications Committee have in common? Appointments based on excellence in life accomplishments and life tenure. It would appear that officials without such life tenure are unwilling to raise serious long term questions of the public interest for even debate if they are unacceptable to strong trade associations. In recent years, many of the spectrum policy controversies in the United States have dealt with the basic issue of whether a proposed technology or service will cause “harmful interference” to existing spectrum users. Resolving these issues has typically taken several years in an era where technology is moving at “Internet speed.” As the Federal Communications Commission (FCC) discussed in its Wireless Innovation Inquiry, the delays and lack of transparency associated with making go/no go determinations on harmful interference may be discouraging private investment in the development of innovative wireless technology. 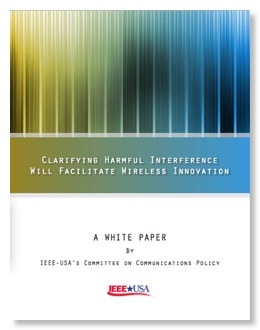 This White Paper reviews the background of what is harmful interference and suggests incremental ways in which the two spectrum management agencies in the United States, the FCC and the National Telecommunications and Information Administration (NTIA), could clarify the definition by giving guidance on the sub-problems associated with harmful interference determinations. Changing the definition is probably impractical, due to the long list of precedents over decades that have been built on the current definition, even though it is not established by statute. The White Paper also suggests that establishing timeliness goals similar to those voluntarily created by the FCC for equally complex and voluminous merger and acquisition reviews could also address the disincentives for private capital formation in the wireless technology area. Such timeliness goals could create a more “level playing field,” with respect to other technical areas concerning private funding of technical development. The cellular industry has severe mood swings with respect to unlicensed spectrum. Presumably the cellular industry is the power behind the recent Spectrum Innovation Act of 2011’s Section 104, which, if adopted, would require an “unlicensed auction” for all new unlicensed spectrum. No one from any industry has spoken publicly in favor of this concept. However, Thomas M. Lenard, president of the Technology Policy Institute has tried to explain its merits in a post entitled “Use the market to allocate spectrum” in another blog. While the intent of Mr. Lenard appears to be limited to spectrum related to the proposed incentive auction, the language in Section 104 would have made any future new unlicensed spectrum nearly impractical regardless whether it was exclusive unlicensed spectrum in the incentive auction spectrum or even secondary/“junk” spectrum use such as for Wi-Fi or U-NII. AT&T said the number of connections to its Wi-Fi network nearly tripled year-over-year in the third quarter to 301.9 million. AT&T also said that the amount of data on its Wi-Fi network in the quarter more than doubled from the year-ago period. The statistics reflect not only AT&T's growing use of Wi-Fi offloading for its cellular networks but also the wider trend within the industry to use Wi-Fi as a tool to manage mobile data traffic. Indeed, AT&T said that users are now making around 100 million Wi-Fi connections per month, more than the total number of connections made in all of 2009 and five times the total number of connections made in 2008. For now at least, neither AT&T nor any other U.S carrier counts Wi-Fi usage toward a subscriber's monthly data allotment. AT&T's Wi-Fi hotspots now number 29,000 across the country, and AT&T said hotel locations account for approximately 40 percent of the carrier's total Wi-Fi network traffic. As smartphone data usage explodes, consumers have begun turning to home, office and public Wi-Fi to bring their handsets online, taking advantage of fast speeds while bypassing the data caps on their mobile plans. There are some exceptions, such as AT&T, but most U.S. mobile operators have been reluctant to incorporate Wi-Fi directly into their networks, preferring instead to keep customers on their 3G and 4G networks, where they can collect data revenues and maintain control of the network connection. With big vendors like Ericsson on board, though, that attitude could be changing. While your blogger was responsible for bringing a total of 5234.5 MHz into unlicensed use through the proposals he drafted and the decisions he helped draft in Dockets 81-413 and 94-124, he does not see unlicensed as a panacea for all the world’s spectrum problems. Exclusive licensed and unlicensed band both have positive points and both contribute towards an efficient telecom infrastructure. It is unfortunate that many on both sides view the choice between licensed and unlicensed as a zero sum game with respect to the long term interests of the cellular industry. The continuing industry interest in Wi-Fi shows that the truth is more complex.